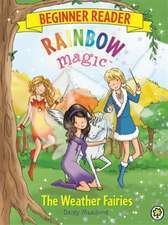 Rainbow Magic is a children's fiction brand originally created by Working Partners and now owned by HIT Entertainment and best known for the children's books published by Orchard Books. The books are ghostwritten by a number of authors under the collective pseudonym Daisy Meadows and illustrated by Georgie Ripper in some books and uncredited illustrators in the latest books. The series follows the lives of Kirsty Tate and Rachel Walker and their magical adventures with their fairy friends. Rainbow Magic books by Daisy Meadows were the most-borrowed children's books at libraries in the United Kingdom, and the second-most borrowed books overall at those libraries, for 2010 and 2011. The Rainbow Magic books are issued by Scholastic Inc. in the USA. Some series and individual book titles vary in the Scholastic editions. There are also coloured Rainbow Magic books for younger readers, which are also published by Scholastic. The books are usually six chapters long and are grouped in sets based on a theme, such as 'The Sporty Fairies' and 'The Jewel Fairies'.